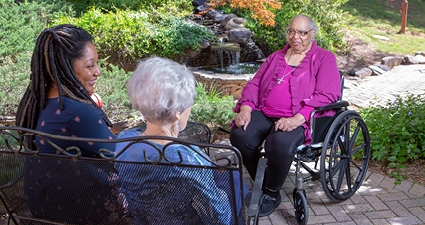 For more than 110 years, A.G. Rhodes Health & Rehab has relied upon compassionate donors and volunteers to help us care for our adult community. These individuals are dedicated to making a difference in the lives of those we serve every day. Their heartfelt service and generous contributions give us the opportunity to uphold a standard of excellence in nursing care. As a nonprofit organization, A.G. Rhodes is entirely focused on serving our residents. Your tax-deductible contributions go directly toward their care. Your donations help with costs that are not covered by insurance, Medicare or Medicaid. These expenses can range widely from rehabilitation services to programs and activities that greatly enhance the quality of life for the seniors who stay with us. Your gift to our Songs for Seniors program will support the Music Therapy Department and will help cover the costs of various items including iPods, downloadable music and headsets, as well as staff training. Your gift to Seeds for Seniors will support the Horticultural Therapy Department and help cover the costs of materials such as seeds, soil, pots and other gardening items. The Living Well Luncheon is a special event to celebrate A.G. Rhodes and its long-standing and positive reputation as an essential resource to Atlanta-area seniors.